Hello all, sorry it’s been so long! We have been so busy in the past few months getting ready to release the new album ‘Here’s a Health’ and preparing for the tour but IT’S FINALLY HERE! After a truly amazing time playing Costa Del Folk (yes, the maidens were flown out to Portugal and it was awesome), we returned home just in time to embark on our UK tour. 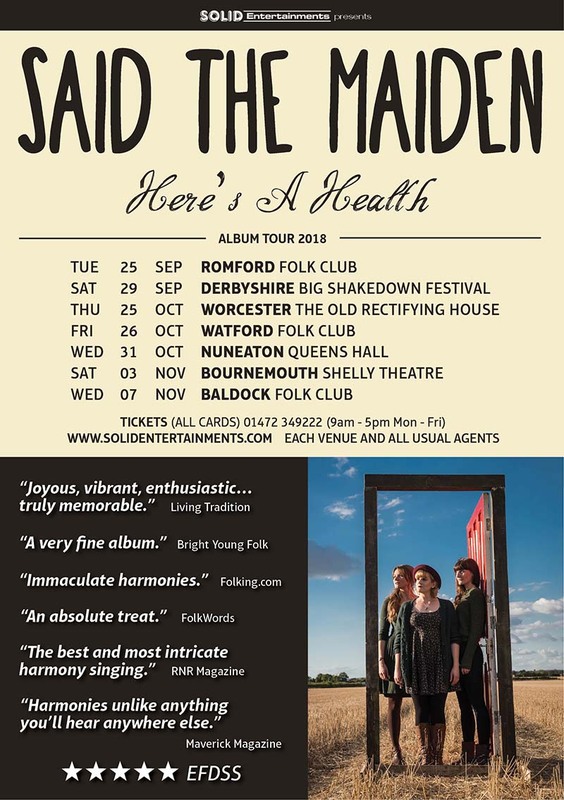 The tour started with an appearance at The Ilfracome Folk Roots and World Music Festival swiftly followed by supporting Lindisfarne at The Subscription Rooms, Stroud. We have also just played our first headline gigs of the tour at the lovely Durham Gala Theatre and Barnoldwick Music and Arts centre, a relatively new venue but definitely one of our favourites, go and see some musicthere if you get the chance. Thanks to all those who have come along so far, we have been having so much fun… but fear not, you are not too late. The rest of the tour kicks off in style Wednesday 1st November, with our album launch at The Water Rats, Kings Cross. It’ll be your first chance to get your hands on our new album and we will be joined by special guests; Chris Cleverley, Griff Jameson (Fred’s House) and Dave Sutherland (Kim Lowings and the Greenwood). Prepare for a bit of a party! Otherwise, hopefully you can catch us at a venue near you throughout November (see below). Gotta go… touring to do. See you soon!